Education-enhanced cutting techniques. All cuts include cleanse, conditioner, and style. Texture and length determine price. Clipper/razor/sheer. Includes cleanse, condition, and finish. Individually crafted color. Includes grey coverage, semi-permanent, and cellophanes. 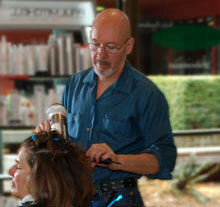 P.M. shines can be applied over a new permanent wave. A subtle blend of lighter color for a natural-looking lift. 10-minute hair color adds more pepper to your salt 'n pepper. Turn straight hair into soft curls and waves. Includes trim. Perm on the top only; no haircut. Nail shaping, cuticle care, polish or buff. Fingertip soak, nail shaping, cuticle care, moisture scrub, masque, warm mitts, massage and polish or buff. Heated footbath, nail shaping, cuticle care, callus smoothing, exfoliating salt scrub, massage, and polish.